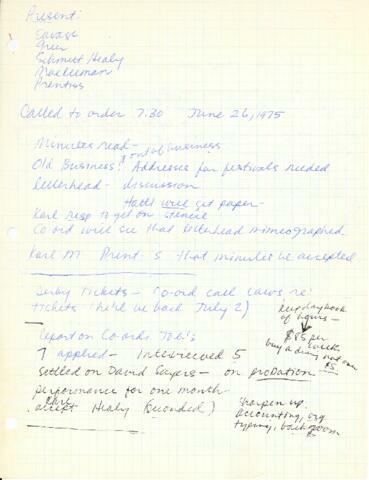 Item consists of handwritten minutes from a board meeting of the Eye Level Gallery from June 26, 1975. Present as the meeting was Roger Savage, John Greer, Julia Schmitt Healy, Karl MacKeeman and Hatti Prentiss. The meeting discussed various issues related to the operation of the gallery. Handwritten notes on acidic graph paper.